Fig. 72 Fixed exchange-rate system. The exchange rate between the pound and the dollar between 1949 and 1967.
a mechanism for synchronizing and coordinating the EXCHANGE RATES of participating countries’ CURRENCIES. Under this system, currencies are assigned a central fixed par value in terms of the other currencies in the system and countries are committed to maintaining this value by support-buying and selling. 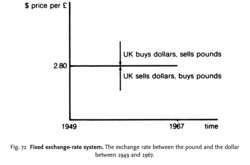 For example, between 1949 and 1967, under the INTERNATIONAL MONETARY FUND'S former fixed exchange rate system, the UK maintained a rate of exchange at £1 = $2.80 with the US dollar (see Fig. 72 ). If the price of the £ rose (appreciated) in the FOREIGN EXCHANGE MARKETS, the UK CENTRAL BANK bought dollars and sold pounds; if the price of the £ fell (depreciated), the central bank sold dollars and bought pounds. Because of the technical difficulties of hitting the central rate with complete accuracy on a day-to-day basis, most fixed exchange rate systems operate with a ‘band of tolerance’ around the central rate: for example, the former EUROPEAN MONETARY SYSTEM allowed members’ currencies to fluctuate 2.25% either side of the central par value. See ECONOMIC AND MONETARY UNION. Once an exchange rate is fixed, countries are expected to maintain this rate for fairly lengthy periods of time but are allowed to devalue their currencies (that is, refix the exchange rate at a new, lower value; see DEVALUATION) or revalue it (refix it at a new, higher value; see REVALUATION) if their BALANCE OF PAYMENTS are, respectively, in chronic deficit or surplus. See DEPRECIATION 1 for details of the back-up factors that are critical to the ‘success’ of exchange rate changes in removing payments disequilibriums. Generally speaking, the business and financial communities prefer relatively fixed exchange rates to FLOATING EXCHANGE RATES, since it enables them to enter into trade (EXPORT, IMPORT contracts) and financial transactions (FOREIGN INVESTMENT) at known foreign exchange prices so that the profit and loss implications of these deals can be calculated in advance. The chief disadvantage with such a system is that governments often tend to delay altering the exchange rate, either because of political factors (e.g. the ‘bad publicity’ surrounding devaluations) or because they may choose to deal with the balance of payments difficulties by using other measures, so that the pegged rate gets seriously out of line with underlying market tendencies. When this happens, SPECULATION against the currency tends to build up, leading to highly disruptive HOT MONEY flows that destabilize currency markets and force the central bank to spend large amounts of its INTERNATIONAL RESERVES to defend the parity. If one currency is ‘forced’ to devalue under such pressure, this tends to produce a ‘domino’ effect as other weak currencies are likewise subjected to speculative pressure. Proponents of fixed exchange rate systems (particularly relatively small-group blocs such as the former European Monetary System) emphasize that in order to reduce ‘internal’ tensions between participants, economically stronger members should play their full part in the adjustment process (for example, revaluing their currencies when appropriate) rather than leaving weaker members to shoulder the entire burden, and countries should aim for a broad ‘convergence’ in their economic policies, both with respect to objectives (e.g. low inflation rate) and instruments (e.g. similar interest rate structures). See BALANCE OF PAYMENTS EQUILIBRIUM, ADJUSTMENT MECHANISM, ADJUSTABLE PEG EXCHANGE-RATE SYSTEM, CRAWLING PEG EXCHANGE-RATE SYSTEM, GOLD STANDARD, FOREIGN EXCHANGE EQUALIZATION ACCOUNT, EURO. In 1992, for example, the British pound suffered similarly dramatic losses as it crashed out of a fixed exchange-rate system that was then operating in Europe. The GCC is not the EU, of course -- in its political and economic homogeneity, number of constituent national members, or resource endowment -- and so may be better placed for currency unification, especially already having a roughly fixed exchange-rate system. And, with that, the eurozone would become as vulnerable as any fixed exchange-rate system has historically proven to be. The impetus to the first act of European monetary integration, the 1970 Werner Report, stemmed from awareness that there were major difficulties in the fixed exchange-rate system established in 1944 at the Bretton Woods conference. In 1971, as the dollar collapsed towards the end of the post-World War II fixed exchange-rate system, U.
government has decided to let China maintain its fixed exchange-rate system if the country increases the value of the yuan by 10 to 15 percent against the dollar, the New York Times reported in its electronic edition Thursday.